When I first started my blog I admit that I was setting out to make some money. I had dreams of turning it into a full time job being my own boss. While I technically could’ve made that a reality by continuing on the path I was on, I decided it made better financial sense to get a full time job and keep working as long as possible. If my online income was completely just a side gig, all of that money could be directed towards savings. One of my other priorities with my blog was to continue to expand my website marketing skills and beef up my resume. That way, even if my blog didn’t produce enough income early on I’d at least be able to leverage it into getting a new job. Things did work out that way, but I never would’ve predicted the extent to which they did. When applying for website marketing jobs, employers always want to see proof that you can deliver results. That can be a little difficult as previous employers may allow their rankings to slip while riding your past efforts. This is where it helps a lot to have your own websites to showcase your marketing skills. In my case, I’ve had my own websites for a while, but unfortunately most of them were penalized by Google last year. So it was quite important that I showed that I could achieve results with my blog. Luckily I’ve done exactly that with my blog so far. In a fairly short amount of time I’ve built up a lot of traffic, impressive rankings and decent social media numbers. During my job interview, they actually mentioned that they noticed the quick progress I had made with my blog and its rankings. I was happy to explain how I had managed to make it this far. It’s quite satisfying to hear that someone has noticed your results and recognized how fast they were produced. As a website marketer you can end up working in a wide variety of industries, often with little relation to each other. For example, some of the industries I’ve marketed include tires, motorbikes, outdoor gear, id card printers, aluminum briefcases and dumpster rentals. Talk about some random knowledge. With my blog it turned out to be a very good decision to target the personal finance niche. Not only is it helping a lot with my own finances, but it also ended up being very relevant experience for this job. My new employer happens to be in the finance industry too. When I saw that on the job posting, I knew I would have an inside edge on a lot of the competition. The affiliate websites that I’ve been running since 2004 are also in the finance niche. So that combined with my blog really made me a strong candidate. After not landing the last job I interviewed for, I thought it might be a good idea to switch up my references. One of my references was a little outdated and one was a boss that I didn’t really see eye to eye with. So they very well could’ve been hurting my employment potential. For one replacement reference I added my long time affiliate rep for my finance websites. While I’ve never actually met him, we’ve had numerous phone conversations and plenty of e-mails back and forth. Over the years he’s likely got to know me fairly well and I know I can rely on him to vouch for me. The other new reference I added is one of my better blogging friends. Like the other new reference, I’ve never met him in person, but I’ve never even talked to him on the phone either. Again I knew I could rely on him to say good things about me and do what he can to help me out. With how much I try to help him, I sure hope he would anyway. I’m not sure if I would recommend including references who you’ve never even met in person, but I think in the internet marketing industry it would be a lot more acceptable. The risk paid off for me at least. Some people see blogging as a way to escape the rat race, but for others it may be a way to get back into the race. It can really lead too all kinds of opportunities. It’s not necessarily just about making some side income. It’s what you make out of it. Has your blog lead to any other opportunities? Would you be willing to use a blogger friend as a job reference? Good insights Jeremy. I definitely agree that a blog can be what you make of it and can lead to numerous opportunities. I think, given the right situation, I’d have no problem using a blogging friend as a reference. Yep, and those opportunities aren’t just limited to full time employment. I’m always hearing of bloggers landing freelance gigs via their blog. Or there are the ones who become full on authors with published books and ebooks. I’m not sure I’d use a reference that I’ve never met, but it just depends on how much trust you have with that person. I’m glad you trusted me and I surely helped you out as much as I could! I hope the new gig pays off for you and is a solid job for years to come; it sounds like it was a wonderful opportunity (based on our emails). Anyway, I’ve never gotten any job offers because of the blog but I do believe I can use it to my advantage when/if I ever look for a new job! I’m sure you will find ways to leverage your blog as your financial advisor business picks up. With your drive I don’t think you’ll need to go back to working a traditional job again. Thanks again for acting as a reference Jason. It does take a fair amount of trust to use references who you’ve never met. I knew I could count on you though. Well good luck with everything going forward. I guess it would be tough to leverage for job opportunities in certain industries. I’d have to say it was pretty ideal for the job I got. 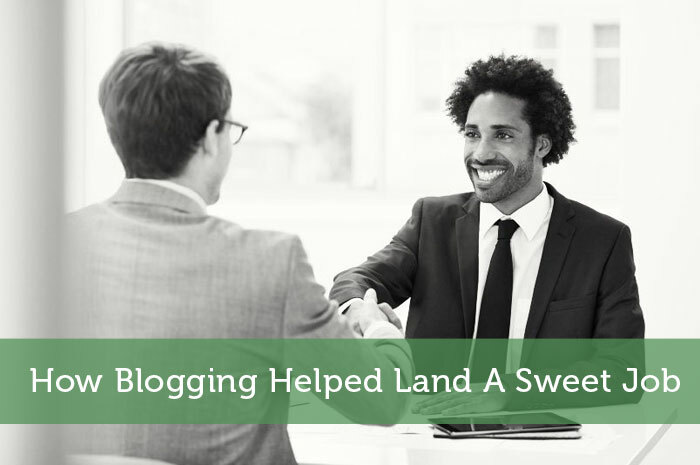 Congrats on the new job and sharing a really cool story of how your blogging activity helped land it. Thanks Stoic. I’m glad you enjoyed the story even though I didn’t really include much about the job itself. That is some great insight. So glad that the blog is so successful so quickly, you are truly talented! Thank you Gillian. If only my writing was as good as my website marketing skills lol. This sounds cool. Part of blogging anonymously is that you can’t really claim your work. Yeah it would’ve been a lot tougher to put my blog on my resume if I was using a pen name. I might’ve still been tempted to include it anyway, but a prospective employer might have doubts when they see a different name on posts. I think it’s great that you were able to find a place where your experience has tons of relevance and they already recognize the potential value that you bring to the table. As for references, I’ve served as a reference for people that I have never met in person – I think that’s the nature of many workforces now and as long as the referrer doesn’t try and imply otherwise it’s totally fine! Yeah I guess with the growth of the internet it’s becoming more and more accepted to use references that you haven’t met. With the amount of time that we spend online, some of our online contacts know us extremely well. My blogging hasn’t gotten that far yet but it may one day. I would use a blogger reference if it was relevant to the job I was applying to. Of course, I wouldn’t ever list references on my resume. I don’t think your blog is too far behind mine. With the amount of effort you put into commenting and guest posting I’m sure you’ll overtake my blog as I slow things down. As for not putting references on a resume, I can understand why some people would do that. Personally I don’t apply to very many jobs. So I try to make things easier for a potential employer by including references form the start. lol I doubt you’d get fired from you blog since you blog anonymously…well as long as you’re not doing blog work on the job. If not, I don’t see it being the dumbest thing you’ve ever done. I know you must’ve made some extra money over the months. I’d have a tough time using a reference I never met but for some reason it does seem to make sense in the internet marketing world. I had a friend whose entire job consisted of getting his company’s website SEO hits up and on the 1st page. When starting Fearless Men I never thought I’d learn so much about blogging. I just wanted to write and share what I had learned in life and see if it helped anyone else. So learning all these blogging tips and tricks has been an added bonus. That’s basically what my job is, but at each position there is always some other roles that have to be taken on. And yeah those kinds of references do work in the internet marketing industry. Someone online can judge my relevant skills fairly well. Good stuff man. Thanks for sharing a little bit about your new job. Working in the financial industry must be pretty cool. Perfect for a financial blogger like you to work your mad marketing skills. Connections in the blogging community is so important. It all helps you out in the end. I met someone through my blog once and now we’re going to investment seminars and such. I’d definitely use blog friends as references if the job position is relevant. How come I’m not invited to those investment seminars?? 🙁 Oh yeah…I don’t know anything about investing yet lol. It does make a lot of sense for me to be doing marketing in the finance industry. Not only does it give me a better perspective on the market, but I might be able to use my blogging contacts to help with marketing my employer’s website. Nah I’ll take all the luck I can get. I know I have the skills, but you need some luck for the stuff that isn’t fully in your control. It does seem like it was a meant to be with the way it was all lined up. lol no I don’t think your blog would help in the industry you work in. It’s really at the opposite end of the spectrum, but that must make it nice to be doing something so different as a side gig. For me it can be a bit tiring to work in front of a computer screen all day and then try to put in more computer work hours in the evening or on the weekends. If I was in something web based, I would have no problem using on online reference I’d never met. With what I do, it probably wouldn’t be relevant. What a great story. Everything does happen for a reason, even if we don’t see it for a while. I agree…in the optometrist industry employers would want to know a lot about your people skills and other skills that aren’t showcased online. It was really by chance that I checked jobs and saw this posting. With the way my online income was progressing, I didn’t even need a job, but I’m glad I came across the job posting. I think your last point really hits it on the head — blogging can be used to get you out of the rat race or back into it, depending on what you want to do. I think it’s great how much you used yoru blog and refernces to get you a full-time job! Right on, man! It was actually part of the plan with my blog all along. I just never expected to be using a blogger friend as a reference. Nor did I expect to land a job with a finance company. Congratulations. This is awesome. I am really happy for you. As far as my blog leading to opportunities, that hasn’t happened yet but that doesn’t mean it won’t. Thanks Miss T. I think you are doing pretty damn well with your blog regardless if it’s led to anything beyond the blog itself. Not too many bloggers can say they have as many paid staff writers as you and such a sweet setup that you only need to put in 1-2 hours per day. I’m sure it will just keep growing and leading to better things. Blogging helped me land my part-time job doing content and social media. I completely agree with you! That’s awesome Lauren. It’s very cool that the skills you developed running your blog led to a job. Blogging has definitely opened the door to some opportunities that I didn’t know existed, from a few free bags of popchips to my current job! It give you an opportunity to showcase your skills and also prove that you can build something out of nothing. Nice work Kate. I actually just won a book the other day via my blog too. Obviously the new job is a much bigger score though. You’re right that a person’s blog shows a lot more than just writing and marketing skills. It shows a person’s initiative and work ethics. Reading into the blog could even reveal a lot about the blogger. Congrats! That’s impressive. I would definitely use a blogger friend as a reference, depending on the circumstances. Especially in this niche, several bloggers are seasoned professionals in their field outside of their blogs. As someone working in the finance industry, it would make a lot of sense to use blogger friends as references. The contacts that you develop could really be extremely beneficial. That is awesome! Are you still going to continue offering the SEO analysis? Thanks Lou. I hadn’t really thought too much about that. I do have on pending project that I’ve put off for way too long. If I can get everything caught up I wouldn’t mind doing the occasional SEO analysis project. For now though I’d have to give people rain-checks. I actually thought about this, but since marketing isn’t my current niche, I would not use a blogger friend for references….yet. We’ll see how things go in a few years, though. Thanks Jacob. The part that I didn’t mention in this post is how much everyone’s support and encouragement helped out. As someone who had some depression issues off and on, that kind of support was huge. Without that help I might not have even applied for the job. My blogging has opened up opportunities for me, but the biggest one was for a political blog I started about 4-5 years back. I met James from DINKs Finance through it and a few months later he hired me to do social media marketing, SEO, and other tasks for their site. It was a great gig for someone in college. Sweet. I didn’t know you did work for DINKs. I guess that was a big part of what led you to eventually start your own finance blog. It also explains why you were able to get such an awesome start with your blog. I should’ve known that you had some existing blogging and SEO experience. Congrats on your new job! That’s awesome! Thanks Jessica. Only problem is how to fit in some local blogger meetups now. I think someone else will have to handle the planning. Well done mate, I totally agree that being able to show what you’re capable of and that you have the drive and initiative to set something like a blog up and see it through to the point you have, well that’s got to be impressive to a prospective employer. Thanks Adam. I’m not sure how much my new employer thought about the personal traits necessary to get a blog going so quickly, but at least they noticed how quick rankings and stats were built up. Congratulations to you! Good job using your blogging contacts to leverage what’s going on in the real world. You’re absolutely right about this being an escape for some – it certainly is for me! I think its pretty cool that you’ve made some life long friends in this process. Thanks MMD. In the past my online work was an escape from working for ‘the man’. These days I really recognize the value of having a full time job and using my websites as side income. I can’t wait to see how much extra cash I have at my disposal once the paychecks start coming in. I’ve also noticed your quick rise! Congrats on success on multiple career fronts. Thank you Brent. It was unexpected how much things have progress this year. To think that earlier this year my savings were being depleted, I had no job and I was struggling mentally. Now I’ve truly come full circle. That’s a huge part of what I gained from blogging too. I have such a different perspective on my finances. I never would’ve started taking it all so seriously if I hadn’t learned so much from fellow bloggers. That’s smart that the marketing company was preaching that. Even if it doesn’t lead to jobs, blogging can help in so many others ways, both personally and financially. Outstanding work, Jeremy! I really love this kind of creative thinking. This is why I can’t believe that people complain about not having a job. You can’t blame Washington for not having a job, you can create one like you did. Kudos! Thank you Shilpan. It really is possible to create your own job if you have the drive and initiative. I know lots of people who have turned blogging into a full time gig, often without any kind of marketing or IT experience. Jeremy, isn’t there a conflict of interest now that you spend time working on this website while you have to promote theirs? I mean… if they know your blog and see that you update it during the day, that’s not a problem? If I were to be working on my blog at my job that would be a problem. It would be easy enough to see exactly when I responded to comments or whatever. I don’t intend to mix the two though. This is a good enough job that I want to put my all into it and do my blogging on my own time. I’ve just spent enough time working for myself to realize that it has its drawbacks. The security of a long term job is huge. Besides to have a good paying job plus a nice amount of online income is bound to make for a lot of extra cash to invest. That’s awesome man. I can’t say I’ve gotten any free products to try from my blog…well no physical products anyway. I have got to try various financial software and scored an investment course. With my latest giveaway I could’ve gotten a canvas print out of the deal, but decided to pass it on as a prize for the contest. I haven’t really thought about where this will all lead in the next year or two, but that is kinda nice to imagine. I’ve definitely used my blog as an example of my writing abilities and web design skills. It’s even led to some freelance work and hopefully will continue to do so in the future. Even though that’s not why I started it, I’m glad that it’s led to that. Freelance work is definitely a good gig to land as a result of your blog. I know there are lots of bloggers who transition into full time freelance work. Congrats on the new job!! I’m like you in that I am using my blog as a side gig to bring in some extra income. I never went into it with a plan of making it my full time job. While it hasn’t grown as quickly as yours has, it still brings in a decent income each month. I would hope it hasn’t grown as quickly considering how much hours I put in early on. I did have hopes that it would turn into a full time gig, but I know it’s better not to rush that. Congrats on the new job!! That sounds sweet, and I think it’s easy to get a great job when the job really matches your experience and knowledge. Sounds like it will be a good fit. I’ve been using my blogging and social media knowledge outside of my online life. It’s gotten me into some other interesting things and I’ve only just gotten started promoting it offline. Yeah I think those factors played a big role in helping me land the job. It obviously makes a lot more sense for them to hire someone with relevant experience as opposed to someone who hasn’t worked in a similar industry. I also told them that my existing contacts could help with marketing their website. So expect to hear from me soon. I have been blogging on and off for a few years, and I don’t have a particular topic. I never really see blogging as potential other job opportunities aside from the obvious (writing job). I have written several articles to different known writing websites such as Yahoo! and Helium. I did get offers to write posts for websites and blogs. I guess if I target writing job, specifically, I get to have jobs I would want. But I don’t think my writing is still up to the standard. Still up for debate. There are still related jobs like social media manager. Even just having a serious blog could impress an employer in any industry.